The LED 3 Light Andon Tower Light Station, has a 2 position industrial selector switch to turn each light section to On & Off. 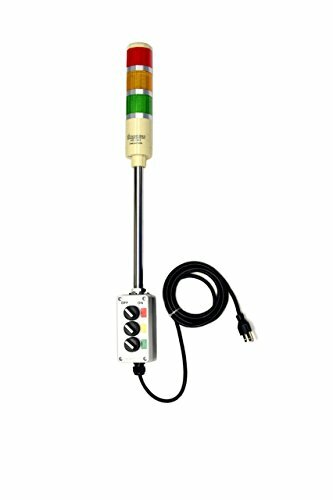 The Red/Amber/Green LED Tower Light is connected to a control box with a 12 inch pole and right angle mounting bracket. The 8 ft., 3 prong power cord can be plugged into any 120 VAC outlet to power the unit. Just mount with two bolts, plug it in to any 120 VAC outlet and you are up & running. No Parts and No Assembly Required to Save you Time & Money! Signaworks continues to be the leader in Industrial Andon Lights since introducing the first industrial rated product over 20 years ago. The Industrial switches create a rugged design. The 24 Super Bright LEDs on the Red & Amber Lights can be see across your plant or office. This is a great communication tool for any Lean Manufacturing Environment or use in a Kaizen Event. The LED Andon Light is easy to mount and is Highly Visible for any Industrial Plant Floor application for Signaling Quality, Engineering, Maintenance, Material Supply or Employee Break in a Manufacturing Cell. It can also be used in a Commercial Office to communicate Assistance, Phone Status, Completed Work, etc. Great for any productivity improvements and reducing downtime! If you have any questions about this product by Signaworks, contact us by completing and submitting the form below. If you are looking for a specif part number, please include it with your message.